"I have to shamefully admit that I thought I'd be buying this double CD simply to listen to it once as way of contributing a few coffers to the cause, and then laying it dormant to gather dust – but no way !" Remind yourself of the days in 2000 when Procol unveiled a new line-up and we plotted the inter-relation of its members ... only Grabham and Brzezicki, we thought, had not played together before. It may be time to renew your acquaintance with our page about unknown words in Procoldom ... indeed, to contribute to it. "What new records have Procol Harum released / Does BtP have search facilities / Is there a Procol Harum newsletter / Is 'Beyond the Pale' a commercial website / Where are the Procol mp3 files / Do you sell bootlegs / What are the words of AWSoP about / Do band-members give you 'inside' information / What happened to BJ Wilson?" Updated our very useful Frequently-Asked Questions page – where all this and more is comprehensively addressed. May 23: Catch Paler John Edgar between 2 and 4 pm UK time in internet broadcast from here, including talk of The Palers' Project and From Shadow to Shadow. We welcome more reviews from Procol Harum fans who have ordered this album. There are still CDs left so order yours while you can. Have a browse on this Whiter Shade of Pale page, specially in the 'Recognition' section – and note how Procol Harum are consolidating their position at the top. This excellent trend partly reflects the energy of the fans who have kept the Procol flag flying ... and the longer we can keep up that energy, the better it will be. Use this link to order securely with your credit card or PayPal account. Immediate despatch. There has been some interesting and heartfelt reaction, to the opinions in the article above, at The Beanstalk, which is the instant-message forum run (at no charge!) by 'Beyond the Pale' for the convenience of Procol fans. 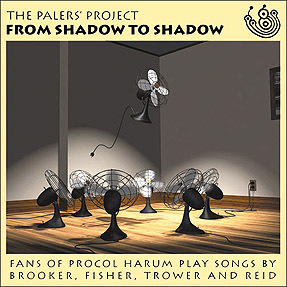 To join this forum – to exchange any opinions or questions about Procol Harum, The Palers' Project, or related matters – just visit this page. Your membership will be under your own control so you can unsubscribe, resubscribe and so on just as you wish. Remind yourself of some of the other remarkable Brooker utterances that have been heard in concert. Once this project has covered costs, all receipts go towards keeping 'Beyond the Pale' running, bringing you Procol news, maintaining the forums, paying online charges and organising special events. Buying this album keeps you in Procol news and features, maintains the band's high profile online, and gives you 160 minutes of fantastic listening enjoyment. So don't delay ... order today! Added some more onstage pictures from Procol Harum's opening British gig from last year. Did you listen to the BBC radio broadcast clip we put up lately? BtP wrote twice to DJ Stuart Maconie – telling him that an album-track is being passed off as a live session – but the mails have not been acknowledged. Meanwhile, read Maconie's curious published comments about mid-period Procol Harum! Last night, again, BBC radio broadcast the 1969 album version of A Salty Dog, asserting that it was a BBC session! Listen to the evidence here, and let us know if you agree. Why not re-read the story of Procol Harum's actual BBC sessions? You can now pre-order the new Procol Harum DVD: Live at the Union Chapel from Amazon USA and Amazon Canada as well as Amazon UK and Amazon Germany. No, it's not strictly a covers CD. Almost all the Procol songs on it are presented in entirely new versions and different styles, and it's a celebration of the songwriting of Brooker, Fisher, Trower and Reid showing how their work – though largely overlooked on commercial releases – works wonderfully well in a great variety of artistically valid and appealing ways. Correct, it's nothing to do with The Palers' Band or their live recordings. That is a scratch band, convening at parties with little rehearsal to play Procol songs in the original arrangements. From Shadow to Shadow is 95% studio work by the Palers' Project, a loose collective giving their time and talents to support 'Beyond the Pale' – and it sounds very polished: online ordering here. Yes, it's a great cover illustration, but BtP cannot take the credit: it was donated for the project by the artist Gerry Guthrie from Illinois in America: you can see more of his work here, and read about his AWSoP epiphany here. Once this project has covered costs, all receipts go towards keeping 'Beyond the Pale' running, bringing you Procol news, maintaining the forums, paying online charges and organising parties and special events. Buying this album keeps you in Procol news and features, maintains the band's high profile online, and gives you 160 minutes of fantastic listening enjoyment.
" ... the sheer bloody inventiveness is stunning ... a voice that I would gladly walk naked in a blizzard over broken glass to hear ..."
Added numerous Procol Harum cover-versions to our list: there are alternative versions of at least 78 Procol Harum songs. Many of these are on the newly-released celebration of Procol Harum song-writing, From Shadow to Shadow, which you can order by clicking here. Of course such lists are meaningless. So let's hope all true Procol Harum fans will go immediately and add some MEANING to them!! Added entries to our page for non-English-language versions of Procol Harum songs: search for 'Saara' and for 'Conjunto Jardín'. You can use your credit-card or PayPal to order these tracks, which are on From Shadow to Shadow, by clicking here. Embellished this report of Procol Harum at Catford, in March 2003, with some hitherto unseen photographs.